Ahmed Yacoubi (Ahmed ben Driss el Yacoubi) was born in 1928 [the precise date is unknown] in el Keddane, one of the most ancient quarters of Fès, Morocco. Yacoubi was a cherif, a direct descendant of the Prophet Mohammed on both his mother's and father's side. His father and grandfather practiced the profession of f'qih―healing by laying on of hands, by the manipulation of fire, herb collecting and brewing concoctions, and by writing of sacred formulas at propitious moments. The office of f'qih was destined to be assumed by Yacoubi, and his education consisted of learning how to treat the sick, of learning the legends, songs and dances of his region, and of memorizing and paraphrasing the Koran. Ahmed Yacoubi first met Paul Bowles in Fès in the autumn of 1947 at the home of Abdessalem Ktiri, who held regular gatherings for students from the College of Moulay Idriss. In Fès, Bowles lived at the Palais Jamaï and continued to write his first novel The Sheltering Sky. After Paul Bowles returned to Tangier, Jane Bowles arrived in Morocco in January 1948. 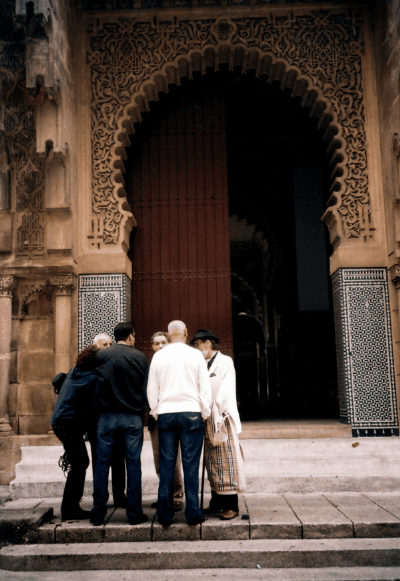 In the spring of 1948, the couple traveled to Fès, and she met Ahmed, who was then secretly drawing with ink. The writer Millicent Dillon quotes Yacoubi in her biography of Jane Bowles: "I was doing sculpture when I was very young, but my father said to try something else because it was against the religion to make idols. I was trying to do some drawings.... it was Jane who first got me to using paint." During the summer of 1950, Paul Bowles, accompanied by Brion Gysin, returned to Fez to work on Let It Come Down and Bowles renewed his acquaintance with the young artist. In the spring of 1951, Bowles again visited Fès with his chauffeur Mohammed Temsamany, who drove the new Jaguar convertible. In June, Bowles invited Yacoubi to travel to Spain to meet his wife Jane Bowles, who was returning from Paris. Yacoubi visited the Prado museum in Madrid and admired the paintings of Hieronymus Bosch, and on this trip he also saw the cathedral in Córdoba. After they returned to Tangier, Paul encouraged and coached him in his work, and they became inseparable friends. In December 1951, Paul Bowles arranged for an exhibition of Yacoubi's paintings in Tangier at the Gallimard Agency bookshop. Yacoubi's work was highly acclaimed and twenty-eight paintings were sold. 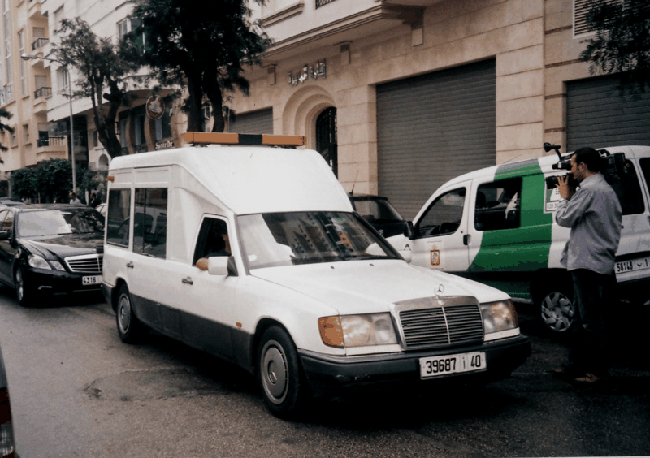 When Bowles moved to Chaouen and then to a hotel in Tétouan to continue writing Let It Come Down, he invited Yacoubi to come to Tetouán and paint. There Yacoubi met the artist Robert Rauschenberg who was living and working in that city. In January 1952, when Jane Bowles returned to New York hoping to take her play In the Summer House from Pennsylvania to Broadway, Paul Bowles decided to escape the Moroccan winter and he took Yacoubi on a six-month voyage to India and Ceylon. They visited Bombay and other areas of southern India and finally Taprobane island. When they traveled to Italy, they stayed at the villa of Albert Rothschild on the shore of Lago di Orta, and Bowles and Yacoubi were asked to appear in the film 8 X 8 by Hans Richter and Jean Cocteau. Continuing their travels, Yacoubi and Bowles went to Venice as guests of Peggy Guggenheim at her Palazzo Vénier dei Leoni. On the way back to Tangier, Paul Bowles arranged for an exhibition of some Yacoubi works at the Galería Clan in Madrid in November 1952. Paul Bowles had written a letter to a gallery owner in New York, urging that an exhibition of Yacoubi's art be held. Jane Bowles, who was already in New York, assisted with this project, and Yacoubi's larger paintings were shown in April 1952 at the Betty Parsons Gallery. Paul and Yacoubi sailed to America in March 1953 and were houseguests of Libby Holman at Treetops, her luxurious estate in Connecticut. Paul Bowles wrote that during this trip Yacoubi was seen in "café society" haunts with Holman so often that he was mentioned in newspaper gossip columns by Walter Winchell, and during this time Yacoubi met the actor Montgomery Clift, socialite Gloria Vanderbilt and the famous playwright Tennessee Williams, among others. While in the United States, successful exhibitions of Yacoubi's paintings were held in Cleveland [79 pictures], Philadelphia, New York, and Stamford and Westport in Connecticut. 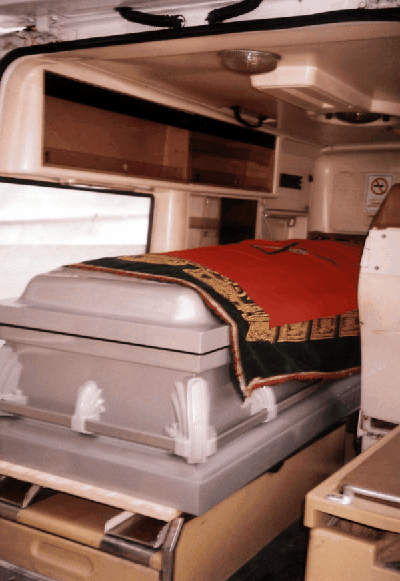 Holman lavished Yacoubi with expensive gifts and clothing. In April, Holman announced to Paul that she was in love with Ahmed. On May 1, Paul Bowles abruptly returned to Tangier, leaving Holman and Yacoubi together. The affair lasted less than three months, and Holman upgraded Yacoubi's return passage to Morocco to first-class. Upon Yacoubi's return to Morocco, Paul Bowles advised him to visit his parents in Fez, but Ahmed soon returned to Tangier where they continued their friendship. Harper's Bazaar magazine published an article about Ahmed Yacoubi in May 1953 edition, which declared: "'King Solomon's Ring', among the acquisitions of New York's Museum of Modern Art, is the work of a Moroccan artist, Ahmed Yacoubi, whose abstract paintings have sometimes the hard brilliance of gems, sometimes the complexity of jungle greens, sometimes the intermingling of the sea's unfathomable blues... Yacoubi is that rarity―an Arab painter...." Robert Morris wrote: "The paintings of Ahmed Yacoubi are those of an artist in full command of a powerful, mature point of view.... To me he stands as a great painter... magically transmuting a kaleidoscopic life's experiences into magical art which encompasses many regions, endowing them all with universality." In May 1954, Bowles asked Yacoubi to accompany him to Rome, Italy, where Bowles and Tennessee Williams were to co-write the script for Luchino Visconti's film Senso. In July 1954, Yacoubi and Bowles also visited Istanbul, Turkey, and they then returned to Tangier with Tennessee Williams. 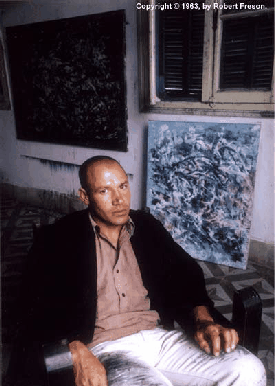 Ahmed Yacoubi's art was again shown in Tangier in the autumn of 1954 at the Galería Provensa. Yacoubi was now living and painting in the Kasbah with Paul in the house overlooking the cliffs on Rue Sidi Bouknadel. And in December 1954, Yacoubi sailed with Jane and Paul Bowles and Mohammed Temsamany to Taprobane island. While in Ceylon there were two exhibitions of Yacoubi's paintings. In April 1955, Bowles and Yacoubi sailed to Singapore, Malaysia, Hong Kong and Japan. One of Ahmed Yacoubi's oil paintings. 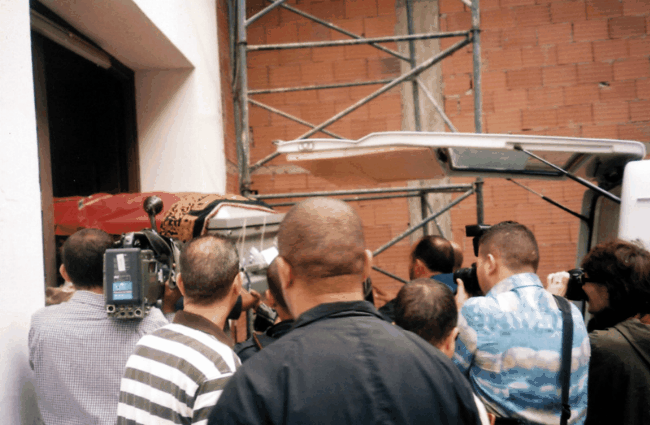 The artist Francis Bacon arrived in Tangier in 1955, and he gave Yacoubi his first oil paints and regularly demonstrated oil painting techniques in his Kasbah studio. Yacoubi was one of the very few who was permitted to observe Francis Bacon paint. In 1956, Paul Bowles and Yacoubi moved into a penthouse apartment in Edificio San Francisco in Tangier, with Jane Bowles and Cherifa next-door. In the winter of 1956 Yacoubi accompanied Paul Bowles to Taprobane island in Ceylon, so Bowles could arrange for the sale of his island. In 1957, Yacoubi traveled with Bowles to Zanzibar and Kenya. In September 1957, Yacoubi went to England with Bowles for an exhibition of his paintings at the Hanover Gallery which had been arranged by the artist Francis Bacon, and to see Jane Bowles, who had received medical treatments after her stroke earlier that year. Ahmed Yacoubi traveled to South America in 1959 for an exhibition of his works at the Barcinski Gallery in Rio de Janeiro, Brazil. Over the next few years his close friendship with Bowles lessened as he became more independent and made other friends. The painter Maurice Grosser also took a great interest in Yacoubi's work when he lived and painted in Tangier. In 1961 the Beat writer William Burroughs wrote an article in the Evergreen Review about Yacoubi's play "The Night Before Thinking". 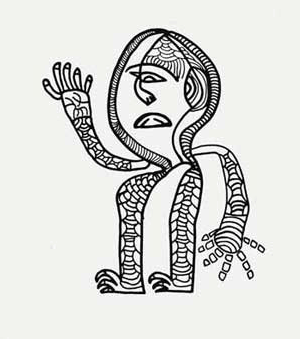 Burroughs wrote: "Yacoubi is mapping timeless areas of magic and therefore his work has a special relevance in the space age since these areas are now open to exploration and we may well look to artists for orientation. The painting of Yacoubi is a window opening into space. You do not look at his pictures but through them." In 1966, Yacoubi immigrated to the United States where he continued to paint in New York; he married Laurel Delaney, but they eventually divorced. Further exhibitions of his art works were held in America and other countries. In New York, Yacoubi became a friend of Ellen Stewart, the founder of La MaMa, and it's Third World Institute of Theatre Arts Studies presented his play "The Night Before Thinking" at the White Barn Theatre in Westport, Connecticut in late July 1974. In 1976, Ahmed Yacoubi met the artist Carol Canon in New York, and they lived happily together for seven years in a loft on Great Jones Street, where they both painted. In 1978, they travelled to Morocco, where she met Paul Bowles in Tangier, later visiting the cities of Fez and Marrakech, and in Casablanca they produced and held two exhibitions of his art works. Although Ahmed Yacoubi is most noted for his brilliant talent as a surrealist and abstract painter, he is also recognized for his stories and tales which Paul Bowles tape-recorded and translated from the Moghrebi into English. These include "The Man and The Woman" (1956) and "The Man Who Dreamed of Fish Eating Fish" (1956), "The Game" (1961), and a play, "The Night Before Thinking", published in the Evergreen Review in October 1961. Yacoubi's The Alchemist's Cookbook: Moroccan Scientific Cuisine, with illustrations by Michael Cotten, was published in 1972 (Omen Press, Inc., Tucson, Arizona). Yacoubi appeared in two films: 8 x 8: A Chess Sonata in 8 Movements by Hans Richter and Jean Cocteau (1957) and Rollover (1981) starring Jane Fonda. Yacoubi's paintings have been collected by many individuals including Peggy Guggenheim, Helena Rubinstein, Jonathan Mayne, Sir Herbert Read, Tennessee Williams, Eric Alport, Pierre Gassier, Albert Rothschild and Montgomery Clift. 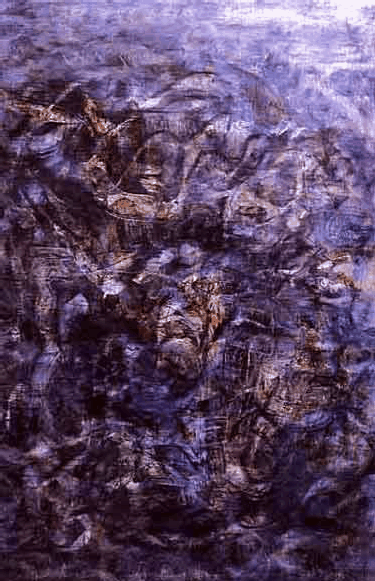 A number of his paintings are on display at the Museum of Modern Art in New York, Le Musée de l'Art Moderne de la Ville de Paris and the Musuem of Contemporary Art in Tangier (Le Musée d'Art Contemporain de Tanger). His daughter Karima Yacoubi died in London in 2004, at the age of forty-four. In early 1985, Yacoubi was diagnosed with both lung and brain cancer and received treatments at the Sloan Kettering Institute in Manhattan. Ahmed Yacoubi died on December 25, 1985, in New York City, at age fifty-seven. He was buried on a snowy day in the Muslim section of a cemetery in New Jersey. 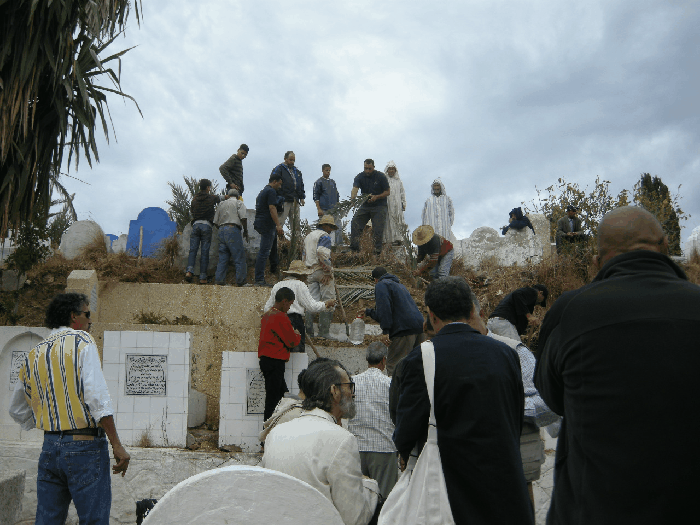 At the request of his family, on September 24, 2009, Ahmed Yacoubi's remains were exhumed from the cemetery in America, and under the High Patronage of His Majesty King Mohammed VI, were flown to Casablanca and then to Tangier for burial in Morocco. 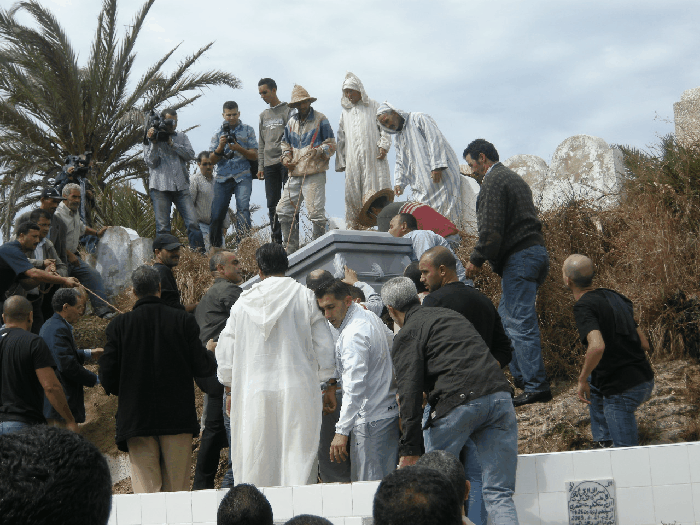 On the afternoon of Saturday, September 26, 2009, after a prayer service held at the Mohammed V Mosque, Ahmed ben Driss el-Yacoubi was reburied in Tangier's Cimetière de Al Moujahidine. 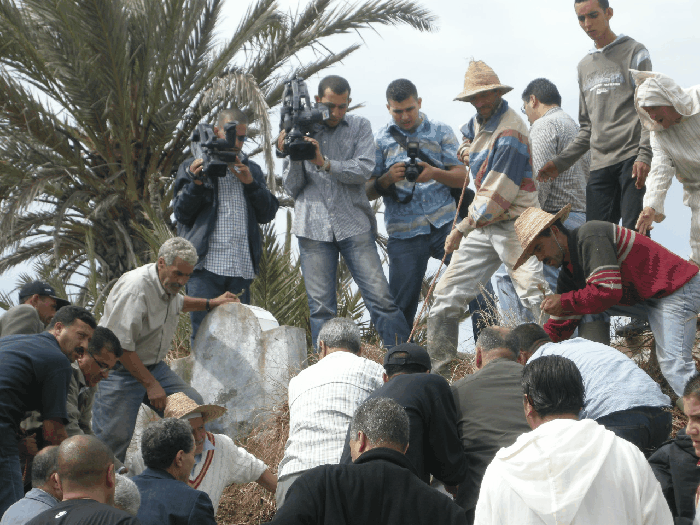 Bensalem Hamesh, the Moroccan Minister of Culture, was among the more than one hundred people present for the funeral and memorial. 2014 La Cuisine de l'alchimiste by Ahmed Yacoubi, translated by Mona Thomas, was published by Actes Sud, Arles, France. This is a new French translation of The Alchemist's Cookbook that was first published in 1972.